Oakland foodies will not have to swim across a lake this weekend to get their hands on good coffee and food. San Francisco may be home to a growing street food scene but Oakland has long served some of the best street food to only the most die hard foodies. Take Sputnik, the floating coffee trailer, as evidence. 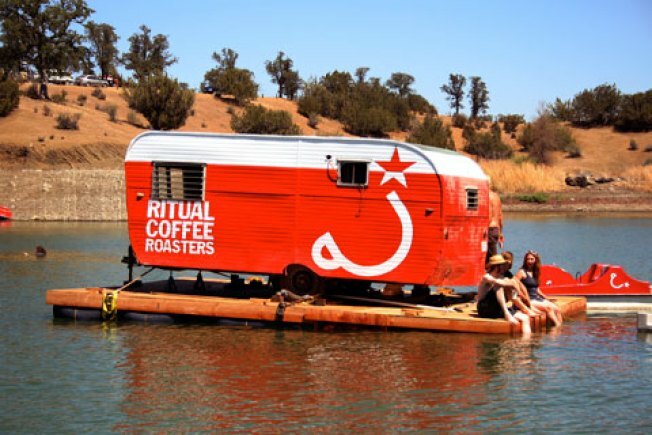 Ritual Coffee Roasters took its new trailer for a test run last weekend by floating it in the middle of a lake and making coffee drinkers either paddle out for a sip of sweet black nectar. "Now that we know our coffee trailer can float, we are ready to take it to the streets," Ritual said. And where is the first place the San Francisco-based coffee maker is taking its cart after is rigorous testing? Oakland of course. Some of the Bay Area's best taco trucks and ice cream vendors have gone unnoticed because most of Oakland's food carts operate in neighborhoods that outsiders often are too scared to venture into. But this weekend that will all change. Ritual will be just one of hundreds of street food vendors at the annual Eat Real Festival at Jack London Square on Saturday and Sunday from 10 a.m. to 9 p.m. Vendors will serve local and sustainable food while a beer shed will feature 40 local microbreweries and local produce will also be sold. Admission is free and all food will be sold for under $5.